Arcane Thoughts: Thanks to you, ArcaneCode made the top 5! Thanks! Thanks to all of you. In the WordPress Wednesday they were showing how rapidly the list of top blogs changes. For a brief time anyway, the Ubuntu post was #5 on the “What’s Hot” list. Read for yourself at http://www.blogherald.com/2007/03/14/wordpress-wednesday-mandatory-update-reminder-wordcamp2007-instant-upgrade-plugin-sxsw-conference-and-more/ or http://shrinkster.com/mvt. ArcaneCode has been averaging about 800 hits a day lately, and has had over 24,000 hits at the time I write this. I just wanted to say thanks to everyone who has read ArcaneCode, and passed on links to all their friends. That’s what the whole social web thing is all about, helping each other out. 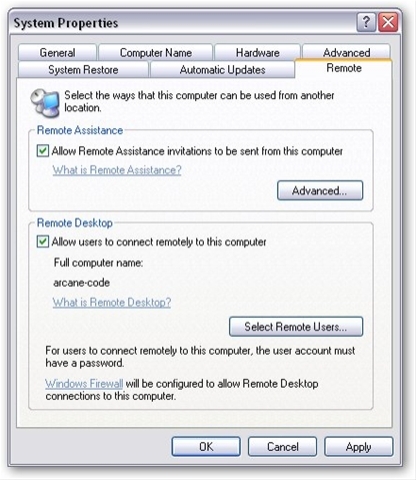 Way back in October of last year (https://arcanecode.wordpress.com/2006/10/09/remote-desktop-connection/ or http://shrinkster.com/mvr) I wrote about using the Remote Desktop tool. A few people have had problems accessing their desktops, so I thought I’d provide some step by step instructions on how to allow your computer to be access via Remote Desktop. First, open Control Panel.Then, open the User Accounts. Click “Change the way users log on or off” and uncheck “Use the Welcome screen”. Click Apply Options. Click on your account, and make sure it has a password. If not, click “Create a password”, then create one. 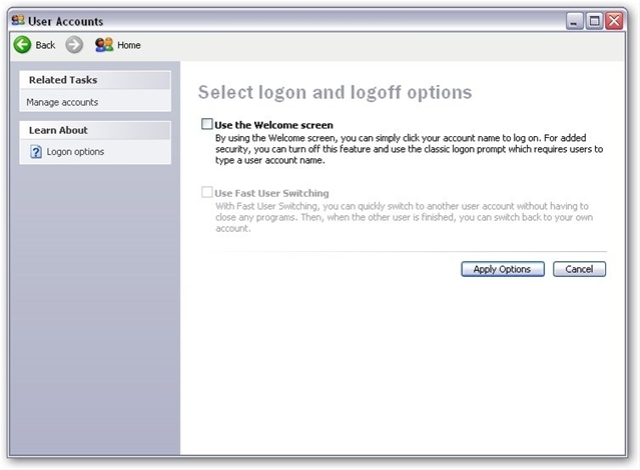 Close out the user accounts, then close out Control Panel. Right click on the “My Computer” icon, and pick Properties. Check the box on that reads “Allow users to connect remotely to this computer”. Click Apply and OK, and you should now be able to access your computer via Remote Desktop. Just follow my instructions in the post I mentioned at the beginning of the message and you should be in good shape!